I will never eat another dish of paella again. I got one of those invites from strangers for dinner: a Catalonian family, the brother of Nuria, who runs the Spanish Fisiocrem business for Paul, the New Zealander, whose El Moli I'm staying at. Angels and Jordi and their two children welcomed me into their home, with Nuria, Marc and 1-year-old Aniol, and Paul, as if I were another old friend. We found out we had more than just horses in common. There was also art, music, birds (owls in particular), and travel. Angels and Jordi have been to Iceland and that is my Mecca. And they were all, this evening, discussing their upcoming family trip to New Zealand (where I've been once, but want to return to actually sight-see, so I got jealous listening). And we had a common appreciation for good food. 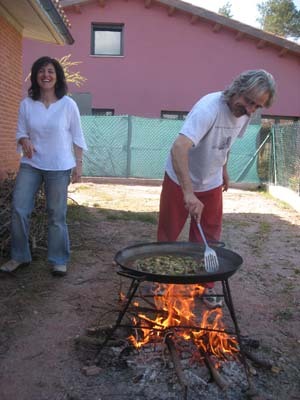 You know how men do the barbecue thing in the US - Jordi was doing the paella pan thing over the wood-and-brush fire pit here - first artichokes simmering in the bubbling olive oil, then garlic and onions and rice and calamari and green peppers. And it was a huge pan. 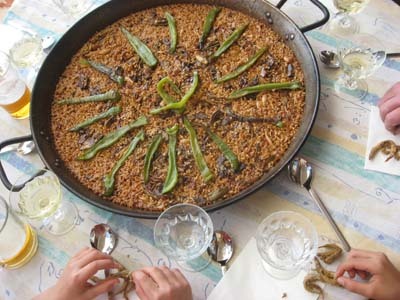 Paella originated in Valencia - the Spanish Autonomous Community just south of Catalonia. I've had paella before, and it has not been my favorite, and I'm definitely not a seafood lover. 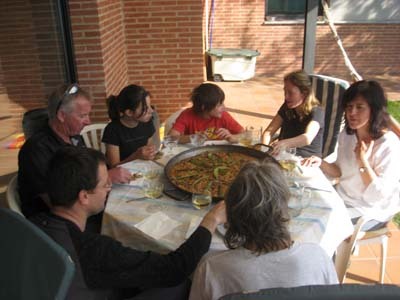 So when I heard paella was being served, while I was a bit squeamish, I know how to be a good guest and be grateful just for being invited for a home-cooked meal, especially by some new Spanish friends. Well. Maybe it was the wonderful place (Catalonia), maybe it was the old and new friends (treasured), maybe it was the talk, maybe it was the way we ate it - in the traditional way, all digging in with a spoon from the original pan. Or, maybe it was simply the BEST paella I have ever eaten. I ate, and ate, and I kept eating. We all did. Wiped the huge pan out. Then came the champagne, and dessert, followed by coffee - more time to sit back, relax, enjoy the company of strangers who immediately make you feel like family, time to let the food and ambience and camaraderie soak in, while the sun slowly dipped behind the hills in the west. It was one of the best evenings ever. 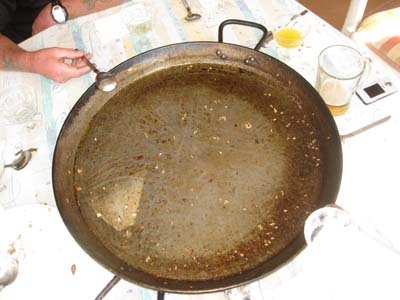 Seriously, that was the last dish of paella I will ever have. I know it can never be as good again. For me, no mas paella.